I got a Magnavox Odyssey 2 in August 2012. I only have seventeen carts, with 21 games on them total, but it’s a start at least. It’s an interesting system; I’d never had a working second gen machine before the O2, so it was a new thing for me. I got an Atari 7800, which I’ve played many 2600 games on, in 2013, but I got the O2 first. I’d been unsure for years about how much I really wanted to get into pre=NES gaming — the NES is the console I knew as a kid, so this stuff is somewhat foreign to me. Games were different before the NES, with so many endless games, multiplayer-only titles, and extremely short games… very different styles of gaming from what would develop starting from 1985 and afterwards. Overall I have mixed feelings about this system; it does have a pretty small library, and a lot of really short or not so great games. Still, the few good games are interesting enough that I feel like it was worth the purchase. You can’t play O2 games anywhere else, legally, either — there are no collections of O2 games on newer systems, something not true for the 2600 or Intellivision. That’s unfortunate, since some of these games are good. Very cool box, wish mine came with one! System looks okay to good. There are several revisions, but this is the model I have. The original Magnavox Odyssey was of course the first ever home videogame system, released in 1972 and designed by Ralph Baer. This system wasn’t designed by Baer, however, but it was the first videogame console that is a successor to an older one. After making some dedicated Pong-style systems in between the two consoles, the Magnavox Odyssey 2 was Phillips Magnavox’s second videogame console and their first with true rom cartridges. It is a second generation machine and released in 1978 in the US, so it released over a year after the Atari 2600 that was its main competition. In the US, it was supported from 1978 to 1983. In Europe, where it was called the Phillips Videopac G7000, it lasted from 1980 to 1984. During that time, the system amassed a small, and almost entirely first party, 45-50 game library; the O2 had minimal third party support. In fact, even the first party stuff was mostly by one single guy — Magnavox didn’t have a large staff to make games for its new system to say the least, so basically this one guy had to do a lot of them. He ended up making 24 games, a majority of the games released for the system during its lifespan. This results in a lot of games with definite similarities — there’s a reason for that beyond the hardware design, many are by the same person. The system has one addon, the voice addon The Voice. It was only released in the US, and adds English-language speech effects to the nine games that support it (plus homebrew titles; most of them support it too). No games require it, however, unlike the IntelliVision’s IntelliVoice voice addon; it’s optional, flavor-speech stuff. The Odyssey 2 has somewhat unique hardware inside the box. The O2 was the first, and one of the only, consoles ever to use an Intel CPU. Programmers were unfamiliar with it at the time, so it probably hurt in terms of getting third party support, but I think it’s pretty cool that it has Intel in the box. The CPU is faster than the Atari 2600’s, but it isn’t nearly as hackable. As a result, O2 games have little graphical variety. First-person or behind-the-car/ship viewpoints are impossible on the O2. Sprite “scaling” effects such as in Solaris or even Outer Space on the 2600 cannot be done, and nor can third-person racing games. The system also has some limitations on sprite variety, as I will explain. However, what you get for this is zero flicker. Unlike the 2600, which has many games loaded with flicker, O2 graphics are rock-solid and never flicker. What it can do, it does flawlessly. O2 games don’t seem to ever have any slowdown either. To go into more detail about graphical variety on the O2, the system also, uniquely, has a built-in character set that includes a lot of graphical elements. You can see many of them in the screenshots posted throughout this article. It is not a coincidence that so many of the games have the same “small person”, “large person”, “tree”, and such sprites; instead, those are all taken from the system’s built-in character set. The system is designed to easily use sprites from that character set. Using custom sprites is more limited; I think that it can only display a few of these at a time. If you look at O2 games, you’ll notice that you never see more than a couple of sprites at any one time that aren’t from the standard character set. Some games get creative here, such as how O2 Demon Attack uses the “tree” sprite for your spaceship, or UFO! and Turtles blinking between two symbols, such as a circle, X, or +, quickly in order to represent an enemy. It works, actually. It is unfortunate, however, that the O2 has such limited graphical variety. It’d be nice if it could do things like Solaris or Enduro on the Atari 2600. Still though, it’s a good console with good games, and you get used to its graphics after playing the system for a while. 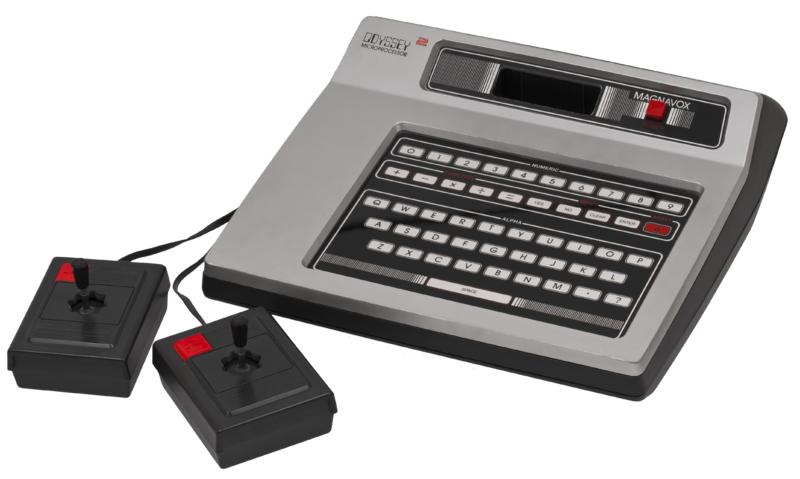 The Odyssey 2 was supposed to have a successor in 1983, the backwards-compatible Odyssey 3. However, because of the videogame crash that started that year, the US release was abandoned while the system was still in testing. Some prototype O3s exist, but it was not released. This system was released in Europe, however, as the Phillips Videopac+ G7400. I’ll call it the Videopac+. The Videopac+ has three exclusive titles, and twelve more games that were released in Europe as dual-mode titles. These games play the same on either a Videopac or Videopac+, but have high-color backgrounds behind the playfield on the Videopac+. Those three exclusive games use the upgraded graphics hardware in the foreground too. Unfortunately Videopac+ systems and games are all entirely PAL region, so you can’t play them in the US unless you have a PAL television to play them on. Many O2/Videopac games do work on either PAL or NTSC, but the Videopac+ console itself will not. O3 prototype systems cannot run Videopac+ games without modification, either. Homebrew O2 releases often have Videopac+ backgrounds, but I don’t know of any that require it; that’d cut off almost all of your American audience, after all. The system does seem a bit more popular in Europe than here, but still, homebrew games just support it, and The Voice, they don’t require either. So, the Odyssey 2 may have a small game library, and only a relative few of those are good, too. And on top of that, many of the better ones are games inspired by more popular arcade or Atari titles. Even so, I find it an interesting system with some fun games; I don’t regret buying this, actually. The system’s graphics are simple, but actually in terms of hardware power it’s actually more powerful in many ways than the 2600, even if you can’t always tell by looking at the games. The system uses an Intel CPU, rare at the time, so programmers weren’t too used to it. Some of the homebrew titles released in recent years show that the system is actually capable of much better visuals than are seen in most of the titles released during its life. http://www.youtube.com/watch?v=WcD6qczYIJY – Here’s the trailer for the 2012 release Mage: The Enchanted Crystals. This trailer has the Videopac+ background, but apart from that it’d look the same on O2. The music might be from The Voice. Looks like a decent game, and it’s in a genre that the system doesn’t have much of, action/adventure games. There’s a cancelled and thus unofficial-release-only release of Tutankham, this, and not much else. As with was normal for the era, many O2 games are two player only titles. This is, of course, frustrating today, but that’s how games were. This means that some games are more playable than others with only one person, excepting the one player only games of course which are fine. Also there’s no saving of anything, so it’s vital to write down your scores for the games — apart from sports games everything else here is score-based, and without any other form of saving, writing down scores is the only way for the games to mean anything. Beyond those usual basics, though, O2 gameplay has some idiosyncrasies, some of which surely result from one guy making so many of the system’s titles. Most (first party, but almost all O2 games are first party; there are only 5-8 third party releases anywhere) O2 games seem to fall into one of five categories. First, sports games (Football, Baseball, Bowling, what have you). Second, games which use the keyboard (there are analogs of Simon, Hangman, Concentration, and more.). Third, action games where you have one life, and start a new game after dying once (the KC games, UFO, Pick Axe Pete, etc.). Fourth, competitive games where you play to ten points (usually against a human, sometimes a computer; examples include Alien Invasion Plus, Out Of This World, etc.). And fifth, timed games, where each game is 2-3 minutes long. Few games don’t fall into any of these five categories, though I guess a couple of the racing games could be a sixth category, racing games that aren’t timed but instead end after you go through enough laps/gates. Yeah, the O2 has some unique game design elements, most notably in the one-life stuff. The system also has three boardgames with O2 videogame components. I am very interested in two of these, Conquest of the World and Quest for the Rings. Both sound pretty interesting, regardless of how good they are. The games have a boardgame element, where you move around or strategize on an actual, physical board, and a videogame element, where you avoid enemies, fight eachother, and what have you. Obviously these are multiplayer only games. As for hardware design, the system looks like something out of its time. That is, it looks very late ’70s to early ’80s. I love some of the box art design — the flying letters and logos look really cool. The box art of the system and games is a real highlight of the system, and is one of the reason I’d always recommend getting complete copies of games, or at least copies with the manuals (all of which have the box art on their covers) — it’s great stuff! Sometimes the box art and manuals are better than the games, that’s for sure… I’ll post some examples of box arts here. Really cool stuff. The cartridges themselves all have handles, which preclude the use of end labels, but the boxes make for good storage devices anyway, with the flap covers, so that’s alright. I got the system locally and paid $50, which might have been a bit too much, but I thought it was worth it because it was guaranteed to work, returnable, and came with six games (mediocre games mostly, but games), and all of the games were complete, too. Not bad, I love the boxes as I’ve said. Honestly with less cool boxes, I might well have passed… but it does. The manuals are all in full color, and are printed with white text on black paper, just like the boxes. They look very stylish, and are full of art, full color screenshots, and very detailed descriptions of how to play the games. The writing is often silly stuff — whoever worked in O2 marketing and manual-writing were marketing geniuses! Seriously, O2 games trumpet things such as “digital scoring”, and the sports games all talk about how “extremely realistic” the simulations of their sport they are. It’s great stuff. O2 game boxes are cardboard in the US, plastic in Europe. The cardboard ones are fine, I think. They have flip-open covers, sort of like the IntelliVision. This makes accessing the game in the box easy. Wow is that amazing boxart! I have seventeen games as of the writing of this article, those six, plus some others I got from EBay. All are complete. I want to have the great boxes for these games! Honorable Mentions: Speedway!, Alpine Skiing!, Out Of This World!, Pick Axe Pete!, Spinout! Acrobats: Mode 3: 657. Mode 0: 637. Mode 6: 430. Mode 6 (I think; could be wrong): 897. With moving balloons, modes 0-2 are no shield, 3-5 are a stationary shield, and 6-8 are random shield. The first of each listed range is for is one player, the second is two player team, and the last is two player alternating. Stationary balloons are modes 9-A-B, C-F, and F-H, in the same order as the others. I prefer moving balloons. And yeah, the game actually is kind of fun with a random shield. K.C. Munchkin: Mode 1: 317. Mode 2: 144. Mode 3: 189. Mode 4: 110. 1-3 are the easy, normal, and hard preset maps; 4 is normal random maps. Game. The left player has missed gates, the right hasn’t yet. Alpine Skiing! – 1979, Two player simultaneous racing game. Alpine Skiing is a very simple ski racing game where two players ski down a mountain. One player is on each side of the screen, and this is a two player only game so either you play on your own, or against someone, but either way both skiiers will be on screen (even if the other is doing nothing). There are three courses in the game, Slalom, Giant Slalom, and Downhill. Each course has a different gate layout, with different spacing between gates as you’d expect from those different events. There aren’t really any turns in Alpine Skiing; instead, you just go down. The only turns will be to get through the gates. That doesn’t mean that the game is easy, though. Quite the opposite, Alpine Skiing is a hard game. The primary reason for this is that if you miss one gate, it’s game over. The only way to get a finishing time is to go through all 44 gates on the course; otherwise, all you’ll be told at the end is how many gates you missed. As usual on the O2, once both players are down the hill, the game will lock, requiring a press of the Reset button to continue. The graphics are extremely basic, with the usual O2 “man” character, on skis this time, as the players. The gates look like gates, and that’s all there is to the visuals. You have good control of your skiier with the stick, as left and right turn while up and down adjust your speed. Alpine Skiing is a simple game, but if you want to finish in a good time, you’ll definitely need practice in order to finish without missing gates. Alpine Skiing isn’t a great game, and it is too bad that there’s no computer opponent (of course, such things were normal back then, but still, it’s too bad), but at least you can play for time with one player. This is an alright game, really simplistic but not too bad. It’s another classically awesome O2 cover… and it reflects the gameplay well, too! Ingame screen. The left player (on the top bar) is currently the paddle, as that “-” indicates (no, it isn’t a negative score), while the right player is the wall guardians, as the little guy indicates. The ?? spaces by them will be filled in by their best scores once there are some. The timer is in the middle. Blockout! / Breakdown! — 1980, One or two player. Blockout! / Breakdown! is, as the name suggests, a Breakout-inspired game with its own twist: it’s all two player! Despite the unique elements, it is clearly Breakout-inspired at a glance. Notice how “Break” is in one mode’s name, and “Out” is in the other… clever, huh? Anyway, as the name suggests there are two modes, but the basic game mechanics are the same in both. Released in 1980, this game is from before the Challenger Series, but, despite its simplicity, it is one of the better games from the first half of the O2’s life, that is, the 1978-80 part, when the games were simpler and often not as good as the later ones. This game is an exception to that. The game also has both single and multi player support, so this is NOT a multiplayer-only game, fortunately — there is AI. You can even have the computer play itself if you want. And on that note, yes, the most unique element in this game is that the game is a versus game. It’s not one paddle against another like Pong, though; instead, one player is the paddle, and the other one defends the wall. So, even though there are a million Breakout clones out there, and many are on systems that Well, this game is limited in longevity, as both modes are timed — there are 60 seconds max per round for one mode, 90 max for the other. Now a full round really is twice that, as you play two separate phases, each that length, but still, each “game” is 2-3 minutes long, or less. That’s all you get here. Fortunately the game is pretty good, so the replay value is high, but still, there’s no Breakout-style infinite score-based mode, only these two timed versus challenges. The games graphics are decent, but are good enough. I like that the blocks are large, and close to the paddle; the original Breakout’s huge field of tiny blocks, far from your paddle, is tough to deal with, and the fact that you’ll only ever hit one block each time the ball goes up the screen in that game makes playing it VERY tedious. I love Arkanoid, but find Breakout incredibly boring. Fortunately, this game entirely avoids that issue. It does have its own block-hitting quirks, as I will describe, but it is a fun game. Anyway, Blockout! is the main mode. In this mode, the ball bounces off of the blocks when it hits them. The way this works is quirky, though — the ball only bounces away if it hits a block from the bottom. If you hit blocks from the top or sides, the ball will continue through the blocks as if they weren’t even there, though yes, they will be destroyed as it passes through. It’s interesting and makes the game a bit different; I don’t mind this. It’s better than Breakout’s “passes through and goes down without breaking them” tedium, by far, and it’s fun to destroy more blocks. The round ends if the player controlling the paddle gets through the wall and reaches the top of the screen. Yes, in this mode you don’t need to destroy all the blocks to progress, you just need to get through. You have 90 seconds to do this. If you succeed, your best time so far will be displayed on the screen, with the other player (or computer)’s best time on the other side. Note that these scores are for the player as the paddle only — the player as the wall demons doesn’t get an individual score, but instead is trying to make the paddle player fail to get through. I will address how, exactly, you defend the wall below, but essentially, as the picture shows, each of the four rows of blocks has a separately controllable demon on it. Move to the edges of the screen to start blinking and get the power to fill in a space, and move into a gap while blinking to replace that missing block. If a demon is knocked off the screen, that line will be without a fixer for a little while, before a new one comes on. The defense controls are confusing and take getting used to, but work reasonably well once mastered. In Breakdown!, the goal is for the player as the paddle to break all the blocks on screen. Unlike in Blockout, in this mode the ball doesn’t get stopped when it hits blocks; instead, it passes right through them. So yeah, it’s like one of those Arkanoid bonus stages, or when you get the powerup of that same effect. The ball, and the demons, both move twice as fast in this mode as they do in Blockout, so it’s a much more frenetic game. You have 60 seconds to clear all of the blocks on screen. The controls and visuals are largely the same as the other game, though. The game’s tougher than it may sound, as hitting every block in such a short time isn’t easy, when the wall is also being rebuilt at the same time. Destroying a row doesn’t get rid of it for good, either; after a little while the block on the right, and the demon in it, will respawn, so you’ve got to hurry to win this. Your score is based on how many blocks remain when time runs out. One of the most important issues any blockbreaking game is how the paddle controls. Now, as anyone who knows the O2 (or has read my summary above) would know, the O2 has only one controller, its digital joystick. It’s a good stick, but it isn’t a rotary or mouse/trackball controller, it’s just a digital stick. Don’t expect analog precision from the controls. However, you do get used to it, and paddle controls here work about as well as they could, given the limitations; the paddle is a bit slow, but it works otherwise, and the game does have the ball bounce off the paddle at different angles depending on where on the paddle it lands, which is great. There are also some design elements that help out in making the game work better than it could have. Most notably, you have infinite balls; the only limit is the timer, not a life counter. As a result, if you miss the ball because you couldn’t get there because of the slow paddle or poor paddle positioning or what have you, don’t worry, just press the button and get a new ball. When playing as the demons defending the wall — and yes, the manual makes clear that they are called demons, even though it’s the usual O2 “little person” sprite — as I’ve said above, the controls are odd. First though, remember that the O2 joystick has notches cut into all eight corners, so that you can easily hold the stick in any one of the directions. This game relies heavily on that fact. In order to move the lowest-tier demon, push the stick to the lower-left or lower-right corners to move left or right respectively. To move the second from the bottom level demon, push left or right. To move the third row up demon, push up-left or up-right. And to move the top row demon, press left or right while holding down the button. Yeah, it’s about as complex as one-button-and-a-stick controls can be, but thanks to the notches in the joystick well it does make sense, after some practice. Expect to do badly at first on defense, but you will get better. Just remember to always go to either edge of the screen to get a block; walk out with one of those guys while not flashing, and you’ll just fall off and lose that row’s guy for a while. Overall, Blockout! / Breakdown! is a simple, short, and fun game. I know I wrote a lot about a very simple game, but it’s pretty fun, and a unique and original take on one of gaming’s most popular second gen era game concepts, so it’s worth the time. This game is cheap, too. Okay cover, though somewhat average for the system. Bowling! / Basketball! – 1978, 2-in-1 cart. Bowling! – One to four players. Bowling is a horrible bowling game, and might be the worst bowling game I’ve played before. The graphics are extremely simplistic, but worst is the physics — the pins don’t move around after being hit, in this game, so there’s almost no possible way of dealing with a split, for instance. To play, the ball moves back and forth along the bottom of the screen. Press the button when you want to roll the ball. Once it’s moving, you can adjust its movement with the stick. The game is for one to four players, but of course in one player mode you’re all by yourself, there’s no computer opponent. The gameplay certainly isn’t anywhere near good enough to be something you’d want to play with others, either, not with this complete lack of physics or graphics of note. Don’t bother with this one. Basketball! – Two players required. Basketball is a two player only side-scrolling basketball game. I haven’t played it properly yet, but it looks like a pretty mediocre game that might be amusing for a few minutes. The graphics are extremely, extremely simple; this is an early O2 game, and looks it. The baskets are barely recognizable as such. The game is side-scrolling 2d, and the controls work like this: So, one player starts with the ball. The other player will take the ball if they pass through the first player. You can shoot, however, with the button. You can’t adjust the shot power or trajectory; it’ll be random, pretty much. If it goes in the basket, you get 2 points. The takeaway ability is kind of amusing, and that’s the only hope that this game has to be any fun at all, I think… I’ll have to try it. I’m not expecting much to say the least. Box. Note the map of the course. Gameplay isn’t quite as bad as it might look. Computer Golf! – 1978, One to four players. Computer Golf is a simple topdown golf game. The game plays on a nine hole course. Each hole has a different design, and you’ll have to avoid the sides of the hole and the trees as you try to hit the ball towards the green. Trees and the sides are the only obstacles in the game, but it’s enough. Once on the green the screen will zoom in to a green view, where you try to hit the ball into the hole. The game is slow paced, as your character walks slowly and the ball isn’t too quick either. Hitting the ball also will take a little practice; read the manual and practice, because it explains which direction the ball will go in from each character position on screen. It’s not entirely intuitive just by looking at it, but you’ll get used to it. You’ll often have to rotate around in order to hit the ball in the direction you want. Overall, this is a bland game, but I don’t like golf in general, so considering that it’s not too bad. I do like how the cover of the box (and the manual) have a map of the nine holes, showing how they actually arrange into a connected course that you never see in the game — nice touch! The manual also gives you par numbers for each hole and the course, which is good to know. This is a slow, simple golf game, and of course you’ll only have opponents if you’re playing against another human, but it was entertaining to play through once, at least. Football! – 1978, Two players required. This is a very basic single-screen football game that I haven’t yet played. I don’t like football, and this isn’t exactly the two player game I’d want to play for sure. The players are all your usual “small person” O2 figures. Decent box though. The box is really cool looking! I love this box. Gameplay is just as good. K.C. Munchkin! – 1981, One player. K.C. Munchkin is the Odyssey 2‘s best known, and most popular, game. The game is most infamous for being banned from sale after Magnavox was sued over how much the game is like Pac-Man. Magnavox lost, but ironically, this game actually has some real differences from Pac-Man — it’s not just a straight clone. I think the courts got it wrong. Fortunately the game was on sale for long enough before being banned that plenty of copies are out there, so this is not a rare game. K.C. Munchkin is indeed a game working from the Pac-Man playbook, but it does some of its own things, as I said. First, the game plays on a strict, 7×9 grid. This really is a tile-based game. Press the stick in a direction, and K.C. will move one space that way. You can’t stop moving halfway into a space and turn around if enemies have moved into it; you’re doomed if that happens. This is somewhat restrictive, but it does work. The upside of this is that this grid system allows for any possible wall configuration — unlike Pac-Man, this game does not have only one maze, it has near-endless mazes, within the rules. But more about that later. The other major difference from Pac-Man are that there are only twelve dots to eat in each level, three in each corner of the map at the start, and they move. And not only do the dots move, but as you collect more dots, the remaining ones speed up. The last dot on each level will move at the same speed you do, so you’ll have to strategize a bit and cut it off. Nice. After a couple of screens, the game will speed up and dots will occasionally go through walls, making things tougher, so it does get more difficult over time. As you’d expect, there are enemies trying to get you, called Munchers, though only three instead of four like Pac-Man has. With the small playfield, it’s plenty. Four of the dots are power pellet analogs which allow you to eat the Munchers. Once you do this the Munchers will change color, and can be eaten. Eaten Munchers will flash white and won’t be a threat again until they go to the center block and stay there for a few seconds; only then can they return to life. This takes a while, so often you’ll finish the level before they return. Munchers you don’t eat will turn back to their normal dangerous state after a couple of seconds, though, and this game is one of the O2 action games where you only get one life (like in reality! ), so one slipup and it’s game over. K.C. Munchkin has three built in mazes, an easy, medium, and hard one. It also has a random maze option which creates a maze for you. Unfortunately this maze won’t change between stages, so once you’re playing on it it’s set, but still it’s a very cool option. The other four game modes are for invisible maze versions of the first four options. In the invisible modes, the map can’t be seen while you’re moving. If you stop or hit a wall, the walls will appear. Needless to say, this adds quite a bit of challenge. Cool feature. Lastly, the game has a map editor, so you can create your own map. You cannot remove the rotating thing in the center of the screen where the ghosts start (and on that note, this rotating block is interesting and makes for some great game mechanics in some stages; too bad you can’t move it or add more of them), you can’t change the one warp (where you travel from one side of the screen to the other), and the dots will always start in the four corners of the screen, but you can put the walls wherever else you want. Of course you can’t save custom maps, so the random map mode is probably more useful, but still, for 1981 this has to have been a very cool feature. K.C. Munchkin deserves its reputation as one of the O2’s best games; this certainly is a very good game. It’s better than I was expecting, too, after having watched some gameplay videos of the game. It may not look like too much in videos, but it’s actually a lot of fun to play. Since you have only one life per game games are short, and the game keeps you coming back for more, trying to get a bit higher score next time. All the different maps mix up play quite a bit, too. Box. Great cover art! And note how it only reflects one of the two games in the package… that’s saying something. Out Of This World is decent. Out Of This World! / Helicopter Rescue! – 1979, 2-in-1 cart. Out Of This World! – Two player simultaneous. Out Of This World, completely unrelated to the other Out Of This World game released much later, is a two player gravity spaceship sim game. It’s in the “first to ten wins” category of O2 games. In this quite challenging game, your goal is to connect your spaceship with a floating command module ten times. Think Apollo moon lander modules taking off and connecting to their command modules above before the return to Earth, that’s the idea here. However, you have very limited energy (fuel), so getting anywhere near ten connections, and winning the game, won’t be easy. You start with just 50 energy, which the manual says is measured in megajoules. When you hold down the button, you’ll burn energy at a rapid clip. However, you need to do this, because you have to land very carefully and slowly, or you’ll crash. Crashing takes away 10 energy, while landing successfully will score you 20. Meanwhile, the Command Module zips by overhead again and again. You need to touch it again, just right, in order to connect and score a point. If you miss, and you will… well, too bad. You’ll probably be too low on fuel to continue, so get your timing just right, every time! That’s easier said than done of course. If either player does connect, both are reset to 50 energy (provided that they are alive that is, and the process starts again until either one player scores ten points, or, more likely, both players run out of fuel and lose. If one player runs out of fuel the other can keep going, but scoring a point won’t bring back the one who has failed. The game has three modes of play, each with a different gravity level. There’s a very low gravity mode (the Moon), a medium gravity mode (Mars), and a high gravity mode (Jupiter). The manual says that higher gravity should be harder, but I found it a bit easier, because it’s a bit easier to hover in place with the tighter controls you get in higher gravity. Of course fuel will burn more rapidly, but control is better. Overall, I liked this game. It’d be fun to play against someone, I think, but even with one player it’s got some play value, until you’re good enough to connect ten times of course that is. It is of course very simple, but well, second-gen games are like that. This game could be better, but it’s not too bad. Helicopter Rescue, however, is atrocious. Helicopter Rescue! – One player only. Unlike the other game on this cartridge, Helicopter Rescue is a completely atrocious, abysmal waste of time. This game is one of the timed games, and it has no modes or options — there’s only one mode of play, and it’s brain-dead simple, two minutes long (literally), and has almost no replay value, either. Yes, this game is that bad. You can tell that it’s kind of just thrown on here, because the game box and cartridge only have Out Of This World art on them. Even in the manual, there’s no Helicopter Rescue art, only spaceships and such. Even marketing knew that promoting this game didn’t make sense… but really, they probably shouldn’t have released it at all. The problem here is that the game has nothing to it. This is a single screen rescue game where you fly a very large helicopter across the screen, pick a person up from the other building that is apparently on fire (you can’t tell, ingame, that anything’s wrong with it), fly back to your base, drop them off, and repeat until the two minute timer runs out. Each pickup or dropoff is accomplished by raising or lowering a basket, and this takes some time. You’ll probably score about five or six points in this game. The scoring shows double digits, but I don’t know if it’d be possible to score ten points. I don’t think it’s worth trying out. There’s absolutely no reason to play it any more and try to get better. The one and only draw here is the rotating chopper blade, which is nice for the second gen I guess, but the “game” is so, so limited that it’s kind of amazing that this was actually shipped. I know it’s from 1982, but it’s so ’70s it hurts! Pick Axe Pete! – 1982, One player only. Pick Axe Pete is a challenging platform action game. It’s an okay game, but not great. It clearly took its largest inspiration from Donkey Kong, but it goes off in its own direction in several ways, so this is not just a clone. At a glance it might look like one, with a screen made up of lines, spheres bouncing around you have to avoid, and a little guy with a swinging weapon, but the actual gameplay is quite different. This isn’t a game where you just go to the end of a level; instead, it’s a more freeform title. The game is difficult and has a fairly high learning curve for a second-gen title; this isn’t one I was good at right away. The 16-page manual is essential, too, as it goes into detail about all of the game’s systems. Essentially, this is a score-based game. As you’d expect, yes, you get only one life per game, so expect short games and low scores, like in other O2 action games. That’s alright, the one-life thing is more unique than bad, I think. The graphics here aren’t anything new; as usual on the O2, most of the sprite work is reused from other games. I’ve certainly seen this “person” figure before, multiple times. Passageways are just colored squares, too. Yeah, bland graphics. Oh well, it’s not too bad. As for the gameplay though, there are six ways to score points in Pick Axe Pete. First, avoiding a rock via jumping or ducking will score you a point. Next, hitting a Gold with your pick gets 3 points. Getting a new pick gets 5 points. Getting a key gets 10 points. Last, going through a door gets 20 points. While you have a pick, you’ll destroy rocks with ease. However, the picks are timed, so after a fairly short amount of time you’ll lose it. At this point, you’d better polish up your rock-avoidance skills. To jump in this game, you press a direction with the stick, and then hit the button. Pete will jump, or duck, in the direction you pointed. So, diagonal up will make a flying leap, left or right a longjump, or straight down to flatten yourself to the floor. Pete will point his arms in the direction you’re going to jump, before you press the button. The manual shows all the signals. This gives you a lot of different moves, but using them well, and effectively avoiding the rocks, is quite challenging. In order to get keys, or new picks, you’ll have to wait until rocks hit each other. When two rocks run into eachother, there’s a chance that the collision will create either a pick or a key. Picks will fall to the bottom level of the field; keys will go to the top one. Both will only stick around on the screen for a few seconds, so the best way to get one is either to stick around the top or bottom of the screen, or to try to get in position to grab it as it goes up or down the screen towards its resting place. If you do get a key and go through a door, you’ll go to the stage that the color you went through represents. The game has ten different stages. You can start from any stage, by pressing different keys (0 through 9 will start on each different level), but you won’t stay on the one you choose; the keys warp between levels. The levels are all similar, except for the placement of the holes in the platforms, but still, it’s a nice touch. Oh, and unlike Mario, Pete doesn’t die if he falls; you can fall down holes no problem. Also, ladders appear regularly, but at random, for you to climb up or down levels. The manual suggests that if one appears right under a door, you can get up to the next level anyway (since you cannot pass through doors without a key but have to jump over them) by getting on the ladder and then doing a diagonal jump, which will take you to the next level. This does indeed work. Overall, Pick Axe Pete is a somewhat complex scoring-based, Donkey Kong-inspired platform action game. It’s tough, and I don’t know how much fun it is, but it certainly isn’t a bad game, anyway, once you get used to it. The gameplay however is may be even more bland than it looks. Pocket Billiards! – 1980, two players required. Pocket Billiards is another pretty awful O2 sports game. As usual it has a great cover, but the contents sure aren’t great. This game is a basic game of pool for a couple of players. You have to play with two people, unless one player plays as both players of course. This is a slow, and extremely bland, pool game — rotate around the white ball, press the button to hit it, and watch it inch along at a slow speed. You don’t get much speed control here, and hitting the balls into the pockets is neither easy nor fun. Really, play a different pool game instead of this one, on some other system. The basic graphics have some charm, but the game is so slow, bland, lacking in ball physics, and tedious that it’s not really worth playing. It’s fairly comparable in quality to Bowling, except here the balls at least do move around when hit, unlike those pins, so it’s slightly better than that one. Good fun game, with decent graphics. P.T. Barnum’s Acrobats! – 1982, one or two players, The Voice enhanced. Acrobats is, in a few words, a Circus Atari clone with some almost painfully ’70s acrobats on the cover. Just like that game, in Acrobats you play as two acrobats on a seesaw springboard in a modified game of Breakout. One starts on the seesaw and the other on a platform. You have the one above jump down, land on the empty part of the seesaw, and send the other one flying into the air. Your goal is to break as many balloons as you can before you run out of tries. There are three rows of balloons in the air, and if you pop all ten in one of the rows, that row will be replenished. Where the acrobat lands on the empty end of the seesaw determines how high the other one will be flung into the air — the closer to the end he lands, the higher the other one goes. Watching the little guys bounce around is fun. Unlike most O2 action games, this one actually gives you ten tries, so it’s not another one-life-and-done game. This is perhaps because of how tricky the game is — in Acrobats, or Circus Atari, in order to keep the game going and not lose a life the clown in the air has to land exactly on the end of the empty, raised part of the seesaw. If you miss, and he lands on the ground or too close in on the seesaw, you’ll lose a try and the guy will climb up the side back to one of the starting platforms and you’ll continue from there (though, again, this will NOT reset your score, the game won’t end until you’ve missed ten times). So yeah, it’s exactly like Circus Atari, as far as I know; I haven’t played that one myself, but this game is an obvious clone. The game is pretty fun, and the graphics are solid — unlike in Circus Atari, the balloons in this one actually look round, and not square, because the O2 does have better graphics than the 2600 when programmed for well. This game is one of only nine officially released titles that supports the uncommon, and US-only, The Voice speech unit addon, too, for some voice bits here and there. If I ever get one, I’ll have to see if it adds anything. It’s the only The Voice game I own so far. Acrobats has a good number of modes, too. You’ve got six basic modes, with two basic variables. First, there are either stationary bubbles, or moving bubbles. Second, there can be no shield, a static shield, or a shield which appears in a new, random location each time one of the acrobats springs off the seesaw. This last one is quite tricky, needless to say — the shield is a hindrance, not a help, as it creates a platform somewhere above the field that the flying acrobat might hit. And if he hits it, he’ll bounce down, and probably then land on the ground and cost you a try. The game has two two player modes, too, in addition to the one player game, and each can be played in any of the six modes. First, you have a standard mode, where each player plays until they lose a guy, at which point it switches to the other one. Second, you have a much more challenging sounding co-op mode where play switches every time that an acrobat springs off of the seesaw. So yes, after every hit the other player will get control. Might be interesting, might just be frustrating. Overall, while Acrobats is just a clone (a clone with a well-known license, but a clone all the same), it’s a good one. This is one of the best O2 games I own — I’d probably put it in fourth, after UFO, Turtles, and K.C. Munchkin. All three games are represented on the boxart. Speedway! / Spinout! / Cryptologic! – 1978, 3-in-1 cart released as a pack-in with the system at launch. Speedway! – One player only. Speedway! is a timed game. Each game is two minutes long, no longer. The game has two modes, Practice (1) or Race (2). On the slower speed, the game’s pretty easy. In this game, you control a car which is driving along a straight, endless (until time runs out) road. Your goal is to avoid hitting all of the cars coming down the screen at you. On difficulty 1, this isn’t too hard; max speed isn’t too high, so getting a perfect game, getting through two minutes without hitting anything, won’t take long. Difficulty two is another story, however. This one is clearly the main game, and it’s a lot more challenging. Speedway has about the simplest graphics around for a racing game, with no animation on the cars and only dashes on the sides of the road to show the environment, but it’s a fun game that I enjoyed playing. This is a fun one to put in and play a couple of minutes of. Of course, the game ends after two minutes, but you can always try again and try to master it. Maybe if I manage a perfect game at the faster speed (should be somewhere around 6,000 points, I think) I’ll stop playing, but that’ll probably take a while… it’s hard to avoid all of the cars coming at you at the high speed, and when you crash you stop getting points until you start moving again, so each hit results in a sizable point reduction. Oh, and your score is tied to your speed, too — you get points based on distance, so the faster you drive, the higher your score will increase. Speedway is an incredibly basic racing game, but it’s fun. As usual on O2 games which end, once time runs out the game freezes. You’ll have to press Reset to try again, but I guess it’s nice to give you a chance to write down your score first. Spinout! – Two players versus (required for anything other than time-trial). The box claims that this is a one or two player game, but it isn’t; this is a two player only game, unless you’re just trying for a lap time or something, and don’t mind having to race as both players for the race to actually end. Spinout is a top-down racing game, along the lines of an extremely basic Super Sprint. There is one track with four variants. The base track’s a loop with a bump on it; it will always be the same, underneath. The variants add some walls you’ll have to go around, and obstacles to avoid. There are two different modes in this game, three lap or 15 lap. I haven’t played it in multiplayer yet, but it seems like an okay, if unexciting, topdown racing game. I like top-down racing games, of course, but without anyone to race against it’s a bit boring. Of course, it doesn’t help that there’s only really one track. This game doesn’t have car controls either, really — instead, the car goes in the direction you point the stick. Holding the button down gives you turbo speed. When you hit the other car, it spins out, hence the title of the game. This game is alright for 1978, but there’s little reason to play it for more than a few minutes over other, much better top-down racing games. Still, I would say that this 3-in-1 cart is worth getting; at least you’re not paying for this one on its own. Cryptologic has … basic … visuals. Cryptologic! – Two players required. Cryptologic is the only game I own that actually uses the keyboard. There are a bunch more that do, but I don’t have them yet. As I don’t have another person to play with I haven’t tried this game yet, but it’s an extremely, extremely simple Hangman-style game, except without a visual hangman. To play, one player types in a word. Then, the computer scrambles the letters, and the other player tries to guess what the word is. The game keeps track of how many tries it took to guess it, and displays which parts you’ve got right too. And that’s really all there is to the game. Yeah, give this one a pass. I mean, anyone with the system surely has it on this extremely common cart, but don’t bother playing it, I don’t think. Thunderball! – 1979, One player only. Thunderball is a subpar pinball game. You get five balls per game in this title, and can score in the tens of thousands of points, so it breaks all the rules of O2 games, probably in the name of being more accurate to the type of game it is supposedly representing. Unfortunately, the actual pinball table in question isn’t anything to speak of. The game has a rectangular “table” that fills the screen. Various targets are arrayed around the screen, and you whack the ball up and try to keep it going as it randomly bounces off of them. There’s virtually no skill here that I can tell; the only real “strategy” is “keep the ball alive, and hope it hits stuff for points”. Thunderball has one unique element, which of course the O2 marketing people trumpet on the box. (I mean, if “Digital Scoring!” is such a big point, this is sure to make the box!) That is that you can move the paddles left and right slightly, within the center of the screen. This is somewhat helpful, but certainly not enough to make this game interesting or all that fun. Oh, the button activates both flippers at once; you don’t have independent flipper control. The best thing about Thunderball by far is the very cool box art; the actual game’s boring and not very fun at all. Decent box. The art is silly. Game screen, the first map. The player is on the right. The six ? spaces are marked. The small x in the center is the bomb refill spot. Placed bombs are also xes, but differently colored. There are three beetles, in blue mode, on screen. Bottom bar, left to right: Lives Remaining, Bombs, Points, Turtlets Saved (total), and Level (that you are currently on). Turtles! — 1983, One player, The Voice enhanced. Turtles is one of the last US-released O2 games, and it’s Magnavox’s only internally developed arcade port, too. That is, this game really is a port of a Pac-Man-style arcade game from Konami, not a game inspired by, but not a port of, an arcade game, like the rest of their arcadelike games are. The back of the box claims that it was a “superhit arcade game!”, but that’s a blatant lie; Turtles is quite obscure, and like many people, I’d never heard of it before looking into the O2’s library. If Turtles was such a “superhit”, then why is the game only on home consoles on the O2, Arcadia 2001, and Entex Adventurevision, and not on any of the most popular consoles (2600, 5200, Colecovision, Intellivision… no for all four.)? Heh. So yes, there are several ways that Turtles stands out among Magnavox’s O2 library: it’s their only direct port of an arcade game, it’s one of the only arcade-style O2 games where you get multiple lives (you get four lives per game here, plus an extra life every 5000 points), too. And on that note, scores here will be much higher than in your usual O2 game. It’s also got a different intro from anything else they did on the system, as I will explain below. And of course, as one of the last releases for the system here, it’s interesting for that reason as well. Fortunately, though, even if it was not popular, Turtles IS a quite good game. This game is easily in the upper tier of O2 games. It’s a classic example of second-gen game design across the board: it’s simple, repetitive, addictive, challenging, and fun. The game has very little variety, but more thank makes up for it with its high challenge and fun factor. This is the kind of game that second-gen fans love; I’ve never been one before, and I do find this game very repetitive, but I must admit that I can see the attraction. And while it’s in the Pac-Man genre, this is its own game; the goal isn’t just to pick stuff up, but to get things (turtlets) and bring them to the houses that randomly appear on the sides of the map. Also, you can drop bombs (mines, really) behind you to attack the enemy with. Only one bomb can be on screen at a time, but still, being able to fight back like this is great, and the strategic thinking of where to place the bomb at any given time helps add to the fun, and the challenge. In Turtles, you play as a mother turtle who has to go into a large house, or hotel, or something, in order to rescue the many kidnapped baby turtlets which have been brought there. In your way are evil bugs, which are trying to stop you from rescuing them. The building has eight floors, so each loop of the game is eight levels long. There are simple little “going up a floor” scenes between levels, too, a nice touch. Getting to the end of a loop will be no easy task, though, that’s for sure — this game is hard! Hard but good, though. It even starts with a little intro scene, something almost never seen on this system. It’s a very simple one where your turtle walks across the screen and into the building, but it works. That intro is here in lieu of a “Which Game?” screen; yes, this game doesn’t have that. Just press any direction on either joystick to play. It’s a one player only game, but you can play with either controller. One more unique element is the way the enemies work. They start out blue; blue enemies will just move around randomly. After a little while, though, they will turn yellow. Yellow enemies can now see you along straight lines, and will usually chase you on sight. Finally, they will later turn red. Red enemies can see around a corner, to home in on you from even farther away. If you hit a bug with a bomb, though, it’ll be reset to blue, and will be momentarially stunned so you can pass over it. You cannot permanently kill enemies. When there are five enemies on screen, all moving around in different directions, some chasing you, as you try to get to a house, the game gets crazy. Fun stuff. For graphics, your turtle does look like a turtle, and the green background is decent, but the bugs leave something to be desired. They’re just circles, which occasionally blink over with +es. That’s it. I know that enemies like this are common on the O2 (see UFO!, etc. ), but still, come on, couldn’t they have drawn something with legs at least? The graphics definitely are basic; the maze looks about on par with KC Munchkin, but the circle/+ enemies aren’t as visually interesting as that game’s baddies. Your turtle does look nice though, and does animate, which is cool. Also like KC Munchkin, this game uses a 9×7 map, as far as the wall layout goes. The original Turtles arcade game had a 9×9 square playfield, but the O2 version is cut back a bit. The level maps are different from the arcade game, though. Other than the smaller field, there are also now only six questionmark points where turtlets can be, instead of eight like the arcade game, and the level designs are all altered as well. They are recognizably similar to the arcade levels, but are not the same. At least it does still have four different mazes, like the arcade version, though; this game isn’t one of those cut-back arcade ports, like the O2’s single-screen-only version of Popeye. There are two different basic floor layouts, with two variants of each, but the arcade game is similar in that respect. As for the sound, the audio is your basic O2 stuff, as expected. The “Warning!” tone when you have no bombs is annoying, but helpful — it’s good to know when you’re out. There is one interesting thing here, though: Turtles makes innovative use of the O2 The Voice addon to make music. Without it there’s no music, as usual on the O2, but with it, the game actually does recreate the arcade machine’s music. Very cool! Overall, Turtles is a great game with plenty of challenge and depth. As it was a late release this game isn’t cheap, but it’s not overly expensive, either; be patient and you should be able to get a copy for as little as $10, maybe $20 on the high end. Turtles is highly recommended! This game may be obscure, but it’s a great game, and this is maybe the best home version of it around. Simple graphics, but it’s a very good game! There are usually more enemies on screen than this. Also, you can’t really see the circle around the player’s ship; it blinks, so screenshots won’t catch it. UFO! – 1982, One player only. UFO! is a space shooter, and my favorite O2 game of the ones I have. UFO has only one gameplay mode, simple graphics (pluses, ovals, and such represent enemy spaceships), only three enemy types, and absolutely no options, but fortunately the one mode it does have is incredibly fun and addictive. (Oh yeah, and the box art is amazing too, as expected from the O2!) The game’s a “one life and you die” game, as expected, but you do have a shield on your ship, so there is some protection. This game is an original and unique take on the single-screen shooter genre. The game is always mentioned as having been primarily influenced by Asteroids, and I see the comparison, but that comparison ends with the basic visual look of the screen. In terms of actual gameplay, this game is entirely different from Asteroids, and in fact is well ahead of its time. Indeed, if it hadn’t been completely forgotten, I’d say that later titles like Robotron 2084 or Every Extend Extra might have been taking a few notes from this title. Yes, essentially this is an arena shooter. Now, in Asteroids, you control a spaceship which flies around a field of rocks, and you shoot them. Alien ships appear every so often, and shoot back, but the regular rocks just fly around. Shooting rocks breaks them up into smaller rocks, which fly around faster and are harder to hit. Your ship has momentum when you move, and you rotate when you press turn instead of moving directly in the direction you press, so careful movement is required. You also have a warp which places you in some random location on screen. UFO! takes a few ideas from that, but not many. First, in UFO you have a shield. When you press fire, or when an enemy hits your ship, the shield goes down momentarily. You only have one life of course, as I said earlier, so be careful while firing — you’re vulnerable during the moments after shooting. Second, in UFO, your ship moves in the direction you press — no Asteroids-style controls here. Firing is entirely different from the norm too, and that’s why I mentioned the later title Robotron — while UFO does not have full twin-stick controls, it has something about as close to that as I’ve ever seen from a pre-Robotron title — you shoot not just in the direction you’re pointing, but in the direction that the white dot on the shield ring around your ship is pointing. The dot rotates, one point at a time, clockwise only, towards the direction you are currently moving in. This takes a bit of getting used to, but once you get it, it’s easy to hit targets. The key is understanding which direction the firing cursor is currently pointing in versus where you’re trying to hit. If you’re moving left and it’s full left, it won’t move. If it’s one point south of left and you move left, though, it’ll spin all the way around the ship until it reaches left. If you stop moving, it’ll stay where it is until you move again, so you’ll be able to fire in the direction it’s pointing as much as you want while standing still. This is, of course, really, really handy, and incredibly unique. I love this single-stick take on a twin-stick control method, and this is from 1982 too, several years before Robotron! Really cool stuff. And also, there’s one more thing — when you kill an enemy, they shoot out three small pellets, one each at a diagonal up left, diagonal up right, and straight down direction. If those pellets hit another enemy ship, it’ll destroy that ship too in a chain reaction. You don’t get bonus points for these beyond the regular score for each kill, unfortunately, but still, it’s really cool to set up chain reactions (and yes, this is what made me think of Every Extend). For the three enemy types, the first one are randomly drifting shapes which simply float across the screen, the analog of Asteroids’ regular asteroids. One point to kill one of these. The second kind are Hunter-Killers, which follow you and try to ram your ship. Three points each. Last are the Light-Speed Starships. These nasty guys come out of the corners of the screen and shoot straight at you with fast-moving bullets. These guys can be hard to avoid getting hit by, so most games of UFO will end when you get ambushed by some Light-Speed Starship fire. The game will speed up a bit as you stay alive, so it does get somewhat more challenging over time. There aren’t any more enemies, or modes, or anything, though. That is disappointing — this is a great game, but some alternate play modes would have been cool. The game is certainly lacking in variety, no question. Still, UFO is incredible for a game from 1982. I love arena shooters, and this is a very early, forgotten arena shooter that most people have probably never even heard of. Well, now you know. Go play it! Oh, the European version has Videopac+ support, so it’s got a color background. The background is black here, but the gameplay is the same. This entry was posted in Classic Games, Game Opinion Summaries, Odyssey 2 and tagged game opinion summaries, magnavox, odyssey 2, phillips, system review. Bookmark the permalink.